most famous cathedrals and basilicas. Home to numerous places of devotion and worship, Italy is the perfect destination for travelers looking to rejoice in their faith. On this Italy tour, overnight in Rome, the heart of Christianity; Assisi, where St. Francis was born, worked, and died; Florence, one of the world’s most beautiful cities; and Padua. Along the way, visit—and even attend Mass at—many of Italy’s treasured basilicas. 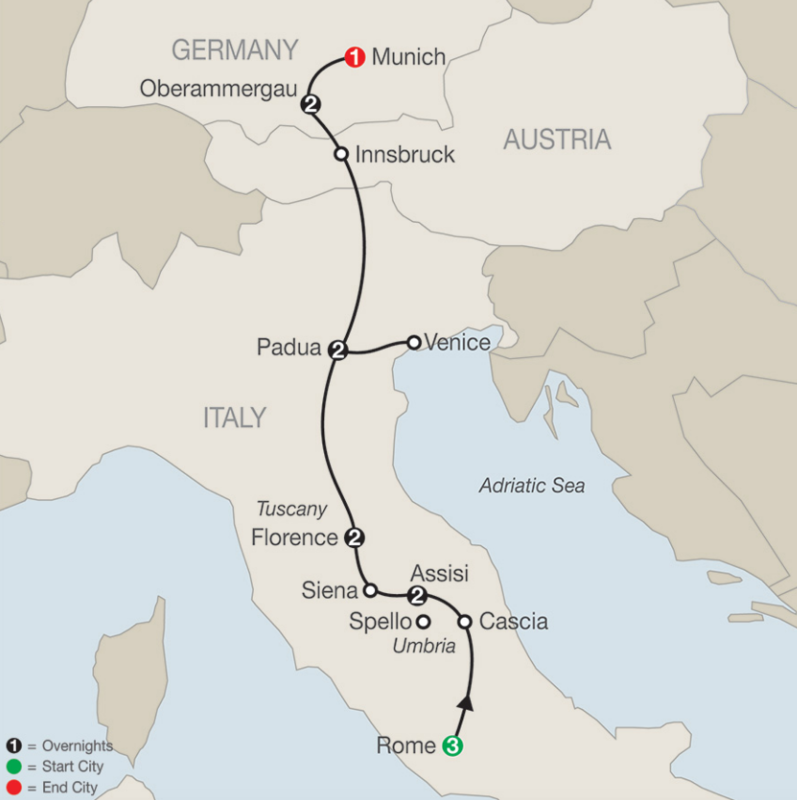 You will also travel to Germany, overnight in Oberammergau and Munich, and attend the world-famous Oberammergau Passion Play, performed every 10 years. Enjoy first-class seating for this remarkable play. In Rome, visit the four major Papal basilicas: St. Peter's Basilica, the world’s largest Christian church; St. Paul Outside the Walls, Rome's second-largest basilica and the burial place of St. Paul the Apostle; St. John Lateran Basilica, the Western World’s oldest basilica and the Papal residence until the 14th century; and St. Mary Major Basilica, the most important Roman church dedicated to the Virgin Mary. Also in Rome, attend the Papal Audience (subject to availability), receive the Papal Blessing, and visit the Holy Stairs, brought from Jerusalem around 326 AD by Constantine the Great’s mother. In Assisi, in addition to St. Mary of the Angels Basilica and the Basilicas of St. Francis and St. Clare, visit the Monastery of St. Damian, a Franciscan shrine built on the spot where St. Francis heard Christ’s voice, and Carceri Hermitage, a peaceful oasis where St. Francis came to pray. In Florence, attend Mass at the Duomo, and see Santa Croce Square, with its Franciscan basilica. In Padua, founded more than 3,000 years ago, visit the Basilica of St. Anthony, dating to the 13th century. From Padua, an excursion to Venice includes a visit to St. Mark’s Basilica. These are just some of the many highlights on this inspirational Italy—with Oberammergau—tour. Welcome to Rome! At 5 pm, meet your Tour Director, then enjoy this evening’s welcome dinner at a local restaurant to celebrate the start of your spiritual journey through Italy. Begin your discovery in Vatican City with a guided visit of the VATICAN MUSEUMS, a unique collection of religious and secular art that spans for centuries, with some of the finest examples of Renaissance paintings, including the SISTINE CHAPEL, world famous for Michelangelo’s ceiling paintings and The Last Judgment, as well as for being the place where the conclave takes place for the election of the new popes. Continue the visit with monumental ST. PETER’S SQUARE where the Pope prays the Angelus every Sunday in front of thousands of believers and the BASILICA, not only an incredibly rich architectural and decorative wonder, but also the place where all Catholic popes are buried. Cross the Tiber River and dip into ancient Roman history. See the Colosseum, the largest amphitheater ever built, and the Roman Forum, site of military processions, elections, trials, and the overall center of Roman public life for centuries. This morning, attend the PAPAL AUDIENCE (subject to availability) for the chance to see the Pope and receive the Papal Blessing. Later, visit ST. PAUL OUTSIDE THE WALLS, one of Rome’s four major Papal basilicas built by Constantine on the grave of St. Paul, and explore the mysterious ancient CATACOMBS that run under the city. During the persecutions, the catacombs were used as places of refuge for the celebration of the Eucharist. Next, visit ST. JOHN LATERAN BASILICA and the HOLY STAIRS, brought from Jerusalem to Rome around 326 AD by St. Helena, mother of Constantine the Great. Officially, pilgrims may only ascend these 28 white marble steps on their knees. Then, visit the hallowed halls of ST. MARY MAJOR BASILICA. Its beautiful treasures are of inestimable value, and represent the Church’s role as the cradle of Christian artistic civilization in Rome. For nearly 16 centuries, St. Mary Major has held its position as a Marian shrine par excellence and has been a magnet for pilgrims from all over the world who come to the Eternal City to experience the beauty, grandeur, and holiness of the basilica. Depart Rome today and head north into Umbria for a stop in Cascia to explore the life of St. Rita, known as the “Saint of the Impossible,” as she went through many problems through the different stages of her life but always managed to get through thanks to her faith and prayer. Visit the BASILICA, see the tomb with the saint’s incorrupt body, and attend Mass. Also, visit the lower basilica, home of the Eucharistic Miracle, which is commemorated each year with the Feast of Corpus Christi. Continue to hilltop Assisi, home of St. Francis and St. Clare. Here, visit ST. MARY OF THE ANGELS BASILICA, where St. Francis consecrated St. Clare as the “Bride of Christ,” and the PORZIUNCOLA, where he founded the Franciscan Order of Friars Minor in 1209. Attend Mass this morning, followed by a guided walking tour of Assisi. Visit the BASILICAS OF ST. FRANCIS and ST. CLARE, and see the crucifix that spoke to St. Francis. St. Francis abandoned a life of luxury for a life devoted to Christianity after hearing the voice of God who commanded him to rebuild the Christian church and live in poverty. He is the patron saint of animals and the environment. St. Claire was one of St. Francis’ first followers and founded the Order of Poor Ladies, a monastic religious order for women in the Franciscan tradition. A short trip by minibus takes you to the CARCERI HERMITAGE, a peaceful oasis in the woods of Mount Subasio where St. Francis came to pray. Finally, visit the MONASTERY OF ST. DAMIAN, a Franciscan shrine built on the spot where St. Francis heard the voice of Christ, and where he wrote the Canticle of the Creatures. The convent founded by St. Clare is still intact, and is where she died in 1253. This afternoon, you may wish to join an optional excursion to magnificent medieval Spello. Follow your Local Guide and visit the ACADEMY OF FINE ARTS with Michelangelo’s David. Later, walk to beautiful Cathedral Square, admire Giotto’s Bell Tower and the Baptistry’s heavy bronze “Gate of Paradise.” Attend Mass at the magnificent DUOMO, with its incredible Renaissance dome designed by Filippo Brunelleschi. Also see sculpture-studded SIGNORIA SQUARE and famous SANTA CROCE SQUARE with its Franciscan basilica. Travel through the Apennine Mountains to arrive in the flat Po area. In Padua, a guided visit of the BASILICA OF ST. ANTHONY shows you the tomb and reliquaries of this miracle-working saint and patron of lost and stolen articles. St. Anthony Is one of the Catholic Church’s most popular saints. He was a powerful Franciscan preacher and teacher. He was born in Lisbon in 1195 and died just outside Padua in 1231, having led a short but very intense religious life. A short drive brings you to Venice. Enter the city in style by PRIVATE BOAT and see the sights with your Local Guide. Visit lavish DOGES’ PALACE, the BRIDGE OF SIGHS, and ST. MARK’S SQUARE and its BASILICA. Time at leisure or take an optional gondola ride. Return to Padua. A scenic drive through the impressive Dolomites brings you to the capital of Tyrol, Innsbruck. Follow your Tour Director for a pleasant walk to the GOLDEN ROOF, and you may wish to shop for crystal, for which the city is famous. Cross the German border and arrive in picturesque Oberammergau. The afternoon and evening are dedicated to the world-famous PASSION PLAY, held every 10 years and performed by the people of Oberammergau. Arrive in Munich, where Germany’s “Secret Capital” comes alive during an orientation featuring the Olympic Stadium, 1,000-foot-high Olympic Tower, and MARIENPLATZ, in the historic heart of the city. Afternoon at leisure; and tonight, enjoy a farewell dinner at your hotel. This vacation, which includes tickets for the world-famous Oberammergau Passion Play, requires an additional deposit of $500 per person in June 2019. Dates & Prices do not include international air travel. The purchase of any travel services offered by Globus, constitutes a contractual arrangement between you and Globus, and represents your acceptance of the Terms & Conditions. Please ensure that you read carefully and understand the Terms & Conditions prior to booking. These Terms & Conditions cover Deposit & Final Payment information, Air-Inclusive Deposits & Final Payment, Revisions & Revision Fees, Air Arrangements, Participation, Travellers Who Need Special Assistance, Young Travellers, Smoking, Price Policy, Visas and Passports, Hotels & Accommodations, Baggage Allowance, Travel Documents, Not Included in the Land Price, Refunds, Service Inquires After the Vacation, Holidays, Safety, Photos & Pictures, Optional Excursions, and Responsibility. Ask your agent for full terms and conditions. The “Starting at” or listed price is based on the lowest price available to book. Price is per person based on twin occupancy and any applicable port charges, non-commissionable taxes and fees and intra-vacation flight are included in the price shown. Any included overnight stay in Canada, applicable GST/HST is also included in the price shown. International airfare, however, is not included. If price is crossed out, the new price shown includes a limited time promotional offer(s). Please review current promotions or deals for additional information. Vacation departures, itineraries and prices are subject to change. Charges not included in the land vacation price: airfare to/from the start/end of your vacation; airline baggage fees including checked and/or excess baggage fees; Federal inspection fees for the Federal Customs and Immigrations; agricultural tax; GST/HST/PST or other per person taxes imposed by government entities; passports; visas and vaccinations; transfers; tips to your Tour or Cruise Director, Local Host, driver, Local Guides, and/or ships' crew; gratuities on ferries, trains, and cruise ships; laundry; telephone; minibar; alcohol, beverages, and food outside of the contracted menu as presented at a hotel or restaurant (these extra items will be billed to you before leaving the hotel, ship, or restaurant); additional excursions and activities not listed as 'included' in the itinerary; porterage at airports or train stations; Travel Insurance premiums; and all other items of a personal nature. For air departure dates within 331 days, you'll be offered a choice of carriers and flight schedules as well as price points to choose from when selecting your flights. Your schedule will be provided to you at the time of booking (schedules are subject to change by carriers). Globus offers 2 air options: Flex Air and Instant Purchase Air. Flex Air allows flexibility if you want to make changes to your vacation schedule. Instant Purchase Air may offer additional airline options but has more restrictions. Some vacations may only offer one Air type option. Guaranteed air-inclusive prices: air is only available to passengers travelling from Canada (with some exceptions from the United States, depending on the selected itinerary). An additional $300 per person non-refundable air deposit is required for Flex Air booked in conjunction with any land vacation (i.e. air-inclusive vacation). Air can only be booked by Globus in conjunction with a vacation package. Instant Purchase Air requires air payment in full at time of booking (i.e. air-inclusive vacation) plus a non-refundable service fee of $50 per person. Once booked, Instant Purchase Air is non-refundable, and non-changeable. Once your airfare is confirmed and Globus has received your full air and land deposit, your air-inclusive vacation price is guaranteed. Air inclusive price quotes will include all government-imposed taxes and fees applicable at the time of booking and will be shown as a Total Amount. Additional airline fees for baggage may apply. At the time of booking your air-inclusive vacation online, carrier Websites will be provided to check baggage fees, or you can visit www.iflybags.com for up-to-date baggage pricing/restrictions. The total airfare price, the base airfare price, and the applicable government taxes and fees are broken-out line-by-line and shown while booking online and on the invoice after your travel is booked. For return travel from some countries, international travellers are required to pay entry and/or exit fees at the airport. These fees will be collected by the local government and are payable by the traveller at time of travel. Your confirmation booking information will contain information about these fees.